Providing Space-Age Solutions for All of Your HVAC Needs! We know that HVAC systems can seem complicated, and when you think something is wrong with yours, you’re probably right. 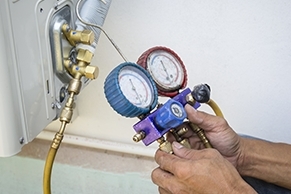 A broken cooling system or furnace brings discomfort to you and your family, so it’s important to get your repair service as soon as possible. At Alien Air Conditioning & Heating, we have the technicians and 24/7 emergency availability you need to solve the trickiest HVAC issues. Our technicians do not work on commission, which allows us to keep our prices affordable for any type of installation or repair. You can always trust your technician to give you honest answers that best suit your family’s comfort needs. Our Friendly In-House Contact Center Gives Us the Advantage of Getting to Know You and Your HVAC System Personally. With a few representatives constantly on call and in contact with each other, you are sure to speak with someone familiar with your situation. This avoids the typical runaround that large companies can sometimes present. At Alien Air Conditioning & Heating, you can rest assured that you always have a helping hand when you need HVAC help! We are APS-Qualified, NATE-Certified and SRP-Certified. Ongoing training is a priority for us, which is why all of our technicians meet once a week to discuss new methods in the industry. We also take the time to reinforce the best tried and true methods. Our team employs the latest technologies when we service your HVAC equipment, and will even take photos of your system before, and after, the job to show you what we fixed. When it comes to HVAC repairs, you need a HVAC contractor you can trust to give you the service you need, when you need it. Contact the professional technicians at Alien Air Conditioning & Heating today to request your next repair or installation!